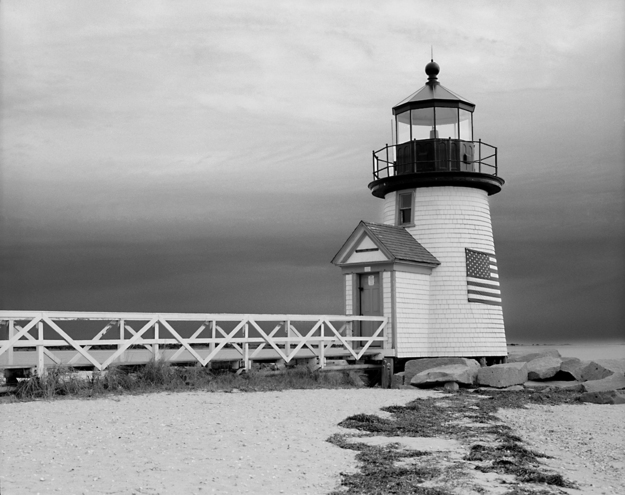 Over the Horizon Photography features Paul Berger's Nantucket landscape photography. Paul uses medium format camera and film to create beautiful prints like this moody shot of Brant Point Lighthouse with the US flag on it. Brant Point Lighthouse in Nantucket, from the town side, with a flag draped around it. Taken with my Pentax 6 x 7 using Fuji Acros film.